Monica Allen Perin, a painter from her youth, began her fine art studies at the California College of Arts and Crafts, Oakland, California. She subsequently obtained a Masters degree in the decorative arts (Museum Studies) at the Fashion Institute of Technology in Manhattan and consecrated her theses to the garden frescoes found in and around Pompeii. Teaching art history with the University of Maryland she continued to teach studio art and paint watercolors of the Italian country and seaside. Following a move with her French husband to the South of France in 1998 she expanded her repertoire to include ‘buon fresco’ painting on fresh lime plaster in the manner of the Renaissance, and is currently involved in an important project to add fresco work to the façade of the parish church in Le Pradet, France. Monica is also a US Navy artist attached to the Naval Historical Center at the Washington Navy Yard, Washington D.C. As a ‘combat’ artist she has passed numerous weeks in ex-Yugoslavia and more recently with the Sixth Fleet in the Mediterranean documenting daily life in an operational capacity on board an aircraft carrier or logistics support with a forward deployed unit. Monica has exhibited her watercolors in Italy, the US and in France, in particular in Marseille, Toulon (awarded best in show for watercolors at the Salon des beaux-arts 2002), and most recently in Cannes where she was awarded the silver medal at the salon international des arts and culture. 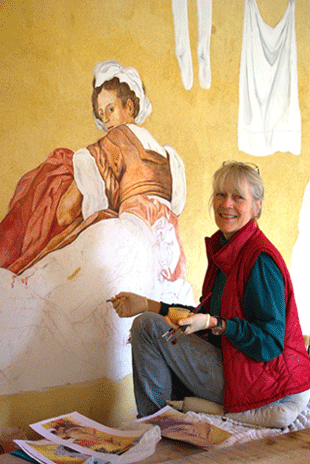 Monica teaches watercolor painting and fresco from her studio in France. 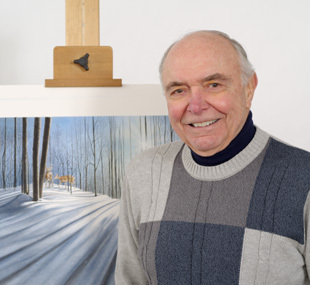 Don Wright is a realist painter, using a meticulous and detail oriented technique, with watercolor as his favorite medium. His award winning work has been shown in many juried exhibitions, including the Butler Institute of American Art, the Hoyt Institute of Fine Arts and the Trumbull Art Gallery. After graduating from the Art Institute of Pittsburgh Don worked as a graphic designer, and later as the art director for a national advertising agency where he remained for 40 years. As an instructor at Youngstown State University he taught courses in air brush technique, graphic illustration and photo retouch. Don is formally retired, but is busier than ever as a design consultant, doing commissioned works and engaging numerous activities with local museums. To see pieces for reproduction purchase of Don Wright artwork click here. Sunday, September 17, 2017, was the world premiere of the “St. Bonaventure Mass” composed by Fabio Luisi to honor the 800th anniversary of the birth of St. Bonaventure of Bagnoregio. It was performed by the Chamber Ensemble of the Buffalo Philharmonic Orchestra and the Buffalo Philharmonic Chorus. 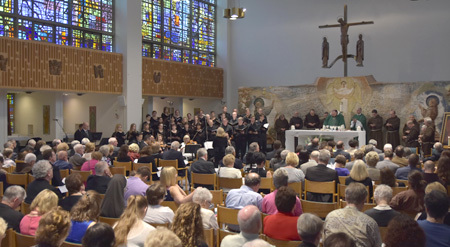 The Anniversary Weekend also included the presentation of Honorary Degrees to Fabio Luisi, Conductor and Composer, and Richard S. Vosko, Sacred Space Planner. Another highlight of the weekend was Barbara Luisi’s exhibition of fine art photographs, “The Spiritual South”.